The problem with “cliff-hanging” Endeavour is that you know how your main character turns out. He’s not going to die, nor remain convicted in prison for the rest of his life. The Remorseful Day is about as bleak an ending for a main character as I can recall. Pretty close to life-like. Morse is old, in poor health, abandoned by his late love. The shine is off for the brilliant detective, reconciled to bird watching for the remainder of his “miserable” life. Even Lewis knows more about birding than Morse, their roles reversed. And, how life-like, Morse dies and Lewis can’t even be there because his profession calls. Well done! I’ve never been good at working crossword puzzles, my feeble attempt at appreciating Opera failed, I don’t like the taste of beer, and I work alone (for the most part), daily, solving small problems. I’ve recently enjoyed poring over many of the 360 degrees images of Oxford University college buildings via the Virtual Tour of Oxford. Did I even know what Michaelmas or Open Admission was before that? But I am impressed that there are tunnels used to port books between the various Bodleian libraries. Still, I’ve reached a time in my life, “old age” and find myself watching stability leave my life with ever increasing speed. Nothing really important has gone lately, but little things. I’ve lived in Fayetteville, North Carolina for almost twenty years. I started work at Fayetteville State University on August 7th, 1995. About six months ago, I passed by a Hardee’s fast-food restaurant, either going to or from work, and realized it had closed. I saw a note on one door, from a distance. Wondered what the note said, but never made a detour to read the note. The building has remained empty. One morning after breakfast, about three or four months ago, I got in my car and headed past Independence Mall. As I looked opposite the Mall, I saw that the Golden Corral was gone. Well, most of it was gone, and it had been there less than a week before. I quickly made a right turn and came around into what had been the restaurant’s parking lot. There was still wreckage of the building in heaps, and heavy equipment parked nearby. I saw no sign of fire. I took a couple of pictures and then left. 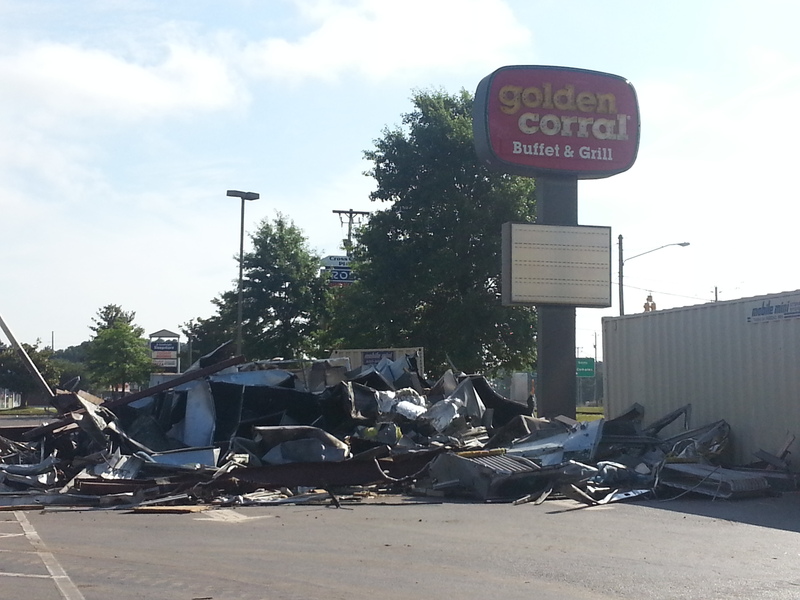 I found that plans were in the works to build a new Golden Corral on the same location. Less than a week ago, as I was having lunch at another Golden Corral (across town), DeWayne, a long-time waiter there, told me that the current location would be closing after the coming Sunday. He and others were to be transferred over to the new location. *I’m not sure if it is open, or will be opened before closing the current location. Still two long-time restaurants that I have visited regularly for almost 20 years have/will disappear. I was born on my cousin, Mary Ann (Kellum) Sharpe’s sixteenth birthday. I think I recall that she has been married to her husband, James “Jim” F. Sharpe for almost 50 years. I like Tom Selleck as an actor. I have especially enjoyed the character, Jessie Stone. But, I have noted how old the actor has become. In addition to liking Inspector Morse, Inspector Lewis and Endeavour, I am a fan of Midsomer Murders. I’ve enjoyed John Nettles, but had noted that in his last episodes he was looking old.